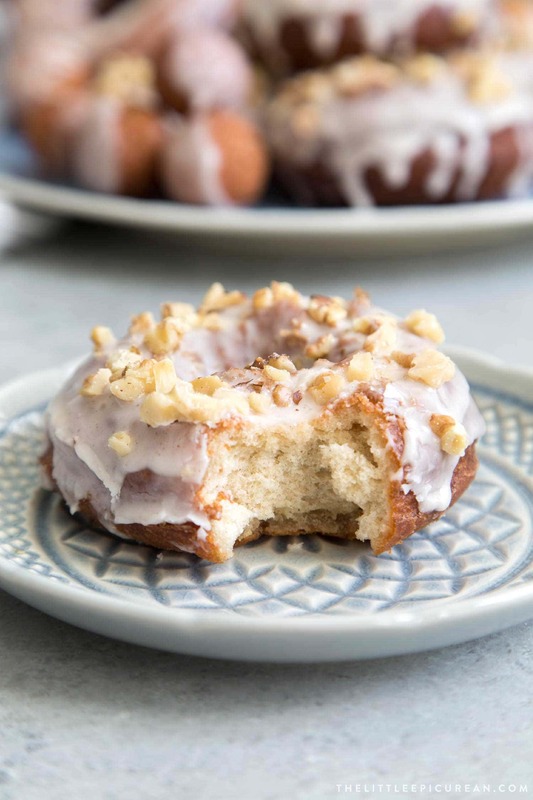 These banana bread doughnuts are fried to a golden crisp, dipped in sweet glaze, and topped with chopped walnuts. With the success from my sweet potato cake doughnuts, I’m venturing into other fruit and veggie purees for baked goods and fried treats. First up, these banana bread doughnuts! Who doesn’t love banana bread? Let me rephrase that. What’s not to love about banana bread?! If you’re a fan of the crispy edges or slightly overcooked parts of banana bread, this is the doughnut recipe for you. When my husband and I were both reaching for the end piece of my zucchini banana bread, the idea hit me. Why not create a banana bread that was crispy all over?! 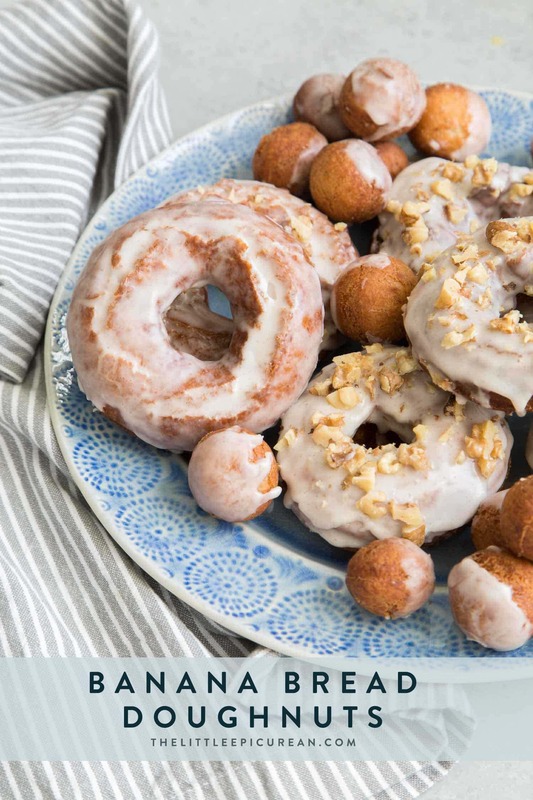 These banana bread doughnuts contain no yeast. As such, the dough relies on baking powder for leavening. Therefore, it is important to use relatively fresh baking powder. Don’t use the old stuff you have had stashed away in the cupboard for years. Otherwise, you will end up with dense brick-like doughnuts. While this banana bread dough is super easy to mix together, it is VERY sticky. You will be to flour your hands, work on a generously floured surface, and flour your 3 1/2-inch doughnut cutter often. Since shortening is solid at room temperature, the fried doughnuts look and feel less greasy. It also results in a crispier exterior. 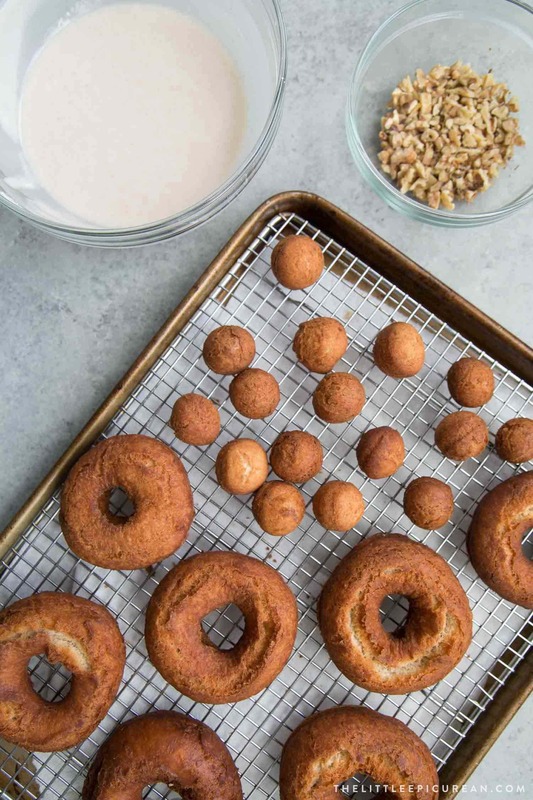 However, since most of us don’t have a giant tub of shortening lying around, these doughnuts can also be fried in vegetable oil or canola oil. Canola oil is slightly healthier, while vegetable oil (soybean oil) is the cheapest option. These two oils have a high smoke point, making them suitable for deep frying. I made these banana bread doughnuts several times to experiment whether frying in shortening versus oil made a difference. IT DID. The ones fried in shortening had a much crispier crust, which I liked. However, it also browned a lot faster, meaning you really have to pay attention to the temperature of the oil. The doughnuts fried in oil were were golden brown in color, but felt a bit greasy. Either way, shortening and oil still resulted in delicious donuts that we gobbled up. Just like for regular banana bread, you must use RIPE bananas. Use bananas that are deep yellow with brown freckles throughout or even bananas that have already turned brown all over. The riper the banana, the more flavorful these banana bread doughnuts will be. King Arthur Flour has some tips for building a stash of frozen overripe bananas so you can make banana bread whenever the craving strikes! In a large bowl, whisk together flour, cake flour, baking powder, salt, and cinnamon. Set aside. In the bowl of a stand mixer fitted with a paddle attachment, cream together brown sugar, sugar, vegetable shortening, egg, and egg yolk. Scrape down bowl as needed to ensure thorough mixing. Add vanilla, sour cream, and mashed bananas. Mix on medium speed until well combined. Add dry flour mixture in three additions. Mix on low speed until there are no longer any dry streaks of flour. The dough will very tacky and sticky. Use a sturdy spatula or a bowl scraper to transfer dough to a medium bowl. Cover with plastic wrap or lid and let dough chill in the fridge for at least 1 hour (overnight is best). Attach candy thermometer to a large heavy bottomed pot (cast-ion or Dutch oven, preferred). Fill pot about 3-inches deep with shortening or oil. Set over medium heat to 350 degrees F.
Remove chilled dough from fridge. Dough will still be sticky. Transfer dough to a generously floured work surface. Flour the top the of the dough and pat (or roll) dough to a thickness of a little less than 1/2-inch. 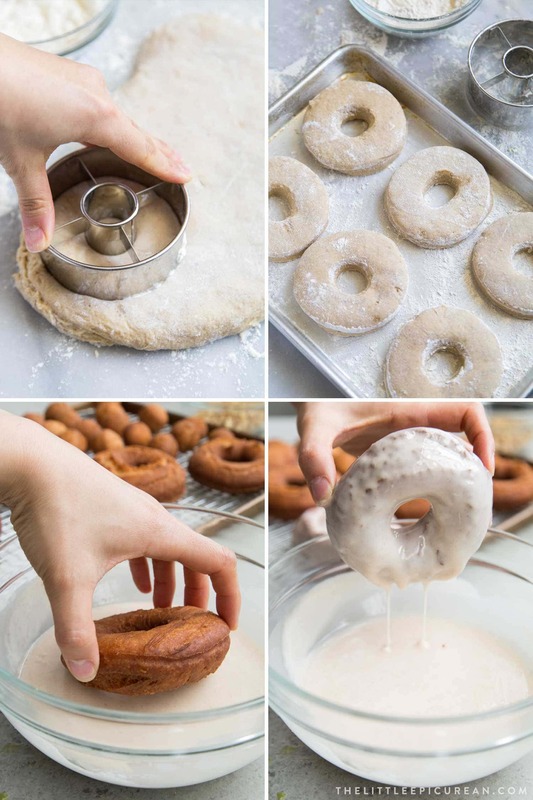 Using a floured 3 1/2-inch doughnut cutter (or round cookie cutters), stamp out doughnut rings. Transfer doughnut rings to lightly floured baking sheet. Gather dough scrapes, knead together, and re-roll to stamp out more doughnuts. Brush off any excess flour from the doughnut rings. Once oil comes to temperature, carefully place 2-4 doughnuts at a time into hot oil. Do not overcrowd the pot. Cook for 2 minutes on each side, until golden in color. Drain cooked doughnuts on a wire rack over a paper towel lined baking sheet. Keep an eye on thermometer and adjust heat accordingly to maintain a constant cooking temperature. Sift confectioners sugar into a large bowl. Stir in salt, cinnamon, corn syrup, and vanilla. Once mixture is well combined, add in hot water. Mix until smooth. Dip warm doughnuts into glaze. Allow excess glaze to drip back into bowl. 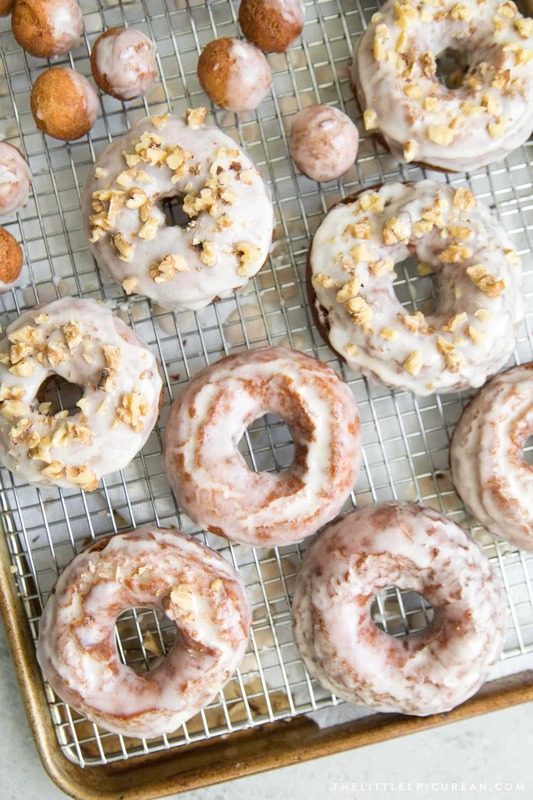 Set glazed doughnuts on wire rack and immediately sprinkle chopped walnuts on top. Allow glaze to see. Enjoy doughnuts warm or at room temperature. This is my favorite vegetable shortening. Use this 3 1/2-inch doughnut cutter, or a 3 1/2-inch round cookie cutter paired with a 1-inch round cookie cutter. 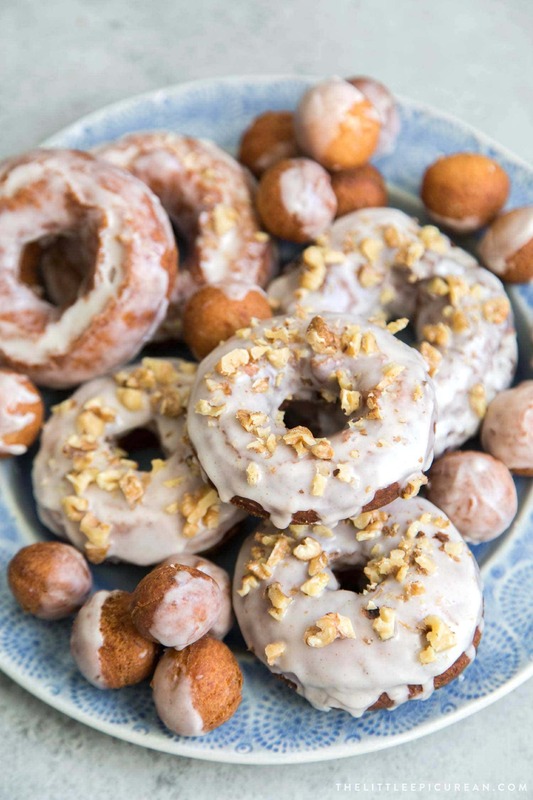 A word on leftovers: Doughnuts are best enjoyed the day they are fried. Store any leftover doughnuts in a breathable box (like a cardboard bakery box or container with the lid slightly jar). The glaze needs air circulation, otherwise it will melt and make the cake doughnuts soggy.